Bill Haley. Me and Bobby McGee. (1979) Rare cover. - Newhillbilly website. 100% American Roots Music. Bill Haley. Me and Bobby McGee. (1979) Rare cover. "Me and Bobby McGee" is a song written by American singer-songwriter Kris Kristofferson and songwriter Fred Foster, originally performed by Roger Miller. 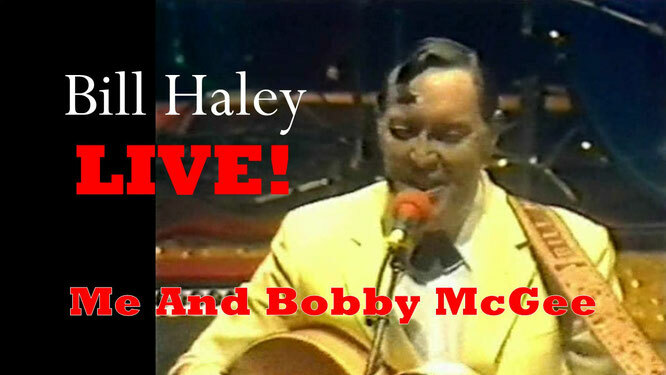 This is a rare cover by the legend of Rock and Roll, Bill Haley. A posthumously-released version of Me and Bobby McGee by Janis Joplin topped the U.S. singles chart in 1971, making the song the second posthumously released No. 1 single in U.S. chart history after "(Sittin' On) The Dock of the Bay" by Otis Redding. Billboard ranked Joplin's version as the No. 11 song for 1971. William John Clifton Haley (July 6, 1925 – February 9, 1981) was an American rock and roll musician. He is credited by many with first popularizing this form of music in the early 1950s with his group Bill Haley & His Comets and million-selling hits such as "Rock Around the Clock", "See You Later, Alligator", "Shake, Rattle and Roll", "Rocket 88", "Skinny Minnie", and "Razzle Dazzle". He has sold over 25 million records worldwide. In 1929, the four-year-old Haley underwent an inner-ear mastoid operation which accidentally severed an optic nerve, leaving him blind in his left eye for the rest of his life. It is said that he adopted his trademark kiss curl over his right eye to draw attention from his left, but it also became his "gimmick", and added to his popularity. As a result of the effects of the Great Depression on the Detroit area, his father moved the family to Bethel, Pennsylvania, when Bill was seven years old. Haley's father William Albert Haley was from Kentucky and played the banjo and mandolin, and his mother, Maude Green, who was originally from Ulverston in Lancashire, England, was a technically accomplished keyboardist with classical training. Haley told the story that when he made a simulated guitar out of cardboard, his parents bought him a real one. One of his first appearances was in 1938 for a Bethel Junior baseball team entertainment event, performing guitar and songs when he was 13 years old. The anonymous sleeve notes accompanying the 1956 Decca album Rock Around The Clock describe Haley's early life and career: "When Bill Haley was fifteen [c. 1940] he left home with his guitar and very little else and set out on the hard road to fame and fortune. The next few years, continuing this story in a fairy-tale manner, were hard and poverty-stricken, but crammed full of useful experience. Apart from learning how to exist on one meal a day and other artistic exercises, he worked at an open-air park show, sang and yodelled with any band that would have him, and worked with a traveling medicine show. Eventually he got a job with a popular group known as the "Down Homers" while they were in Hartford, Connecticut. Soon after this he decided, as all successful people must decide at some time or another, to be his own boss again – and he has been that ever since.' These notes fail to account for his early band, known as the Four Aces of Western Swing. During the 1940s Haley was considered one of the top cowboy yodelers in America as "Silver Yodeling Bill Haley". The sleeve notes conclude: "For six years Bill Haley was a musical director of Radio Station WPWA in Chester, Pennsylvania, and led his own band all through this period. It was then known as Bill Haley's Saddlemen, indicating their definite leaning toward the tough Western style. They continued playing in clubs as well as over the radio around Philadelphia, and in 1951 made their first recordings on Ed Wilson's Keystone Records in Philadelphia." On June 14, 1951 the Saddlemen recorded a cover of "Rocket 88". During the Labor Day weekend in 1952, the Saddlemen were renamed Bill Haley with Haley's Comets (inspired by the supposedly official pronunciation of Halley's Comet, a name suggested by WPWA radio station program director, Bob Johnson, where Bill Haley had a live radio program from noon to 1 pm), and in 1953, Haley's recording of "Crazy Man, Crazy" (co-written by him and his bass player, Marshall Lytle, although Lytle would not receive credit until 2001) became the first rock and roll song to hit the American charts, peaking at number 15 on Billboard and number 11 on Cash Box. Soon after, the band's name was revised to Bill Haley & His Comets. In 1953, "Rock Around the Clock" was recorded by Haley. Initially, it was relatively successful, peaking at number 23 on the Billboard pop singles chart and staying on the charts for a few weeks. A month later it re-entered at number one. Haley soon had another worldwide hit with "Shake, Rattle and Roll", which went on to sell a million copies and was the first rock 'n' roll song to enter the British singles charts in December 1954, becoming a gold record. He retained elements of the original (which was slow blues), but sped it up with some country music aspects into the song (specifically, Western swing) and changed up the lyrics. Haley and his band were important in launching the music known as "Rock and Roll" to a wider audience after a period of it being considered an underground genre. I was feeling near as faded as my jeans. And rode us all the way to New Orleans. I was playing soft while Bobby sang the blues. We sang every song the driver knew. Nothing don't mean nothing honey if it ain't free, now now. Hey, Bobby shared the secrets of my soul. Hey Bobby baby kept me from the cold. To be holding Bobby's body next to mine. La la la la la Bobby McGee. La la la la la, Bobby McGee, la. La La la la la la la la la, hey now Bobby now Bobby McGee yeah. Hey now Bobby now, Bobby McGee, yeah. Hey, hey, hey, Bobby McGee, Lord! Hey, hey, hey, Bobby McGee.